Molluscum contagiosum. I actually had to google it myself to make sure I spelled it correctly-the name is that much of a mouthful. Molluscum is one of the most common pediatric infections there is, certainly the most common pediatric infection seen by dermatologists. Hardly a week goes by that we don’t treat a child with molluscum-some days we see 3 or 4 kids with it – yet no one seems to have heard about it. It seems to be pretty much off the radar at mommy groups, PEPS, and other forums for parents. Mulloscum is a very common viral infection that only affects the skin and mostly shows up in kids. It makes bumps that look a bit like chicken pox, but molluscum does not cause any kind of fever, headache, chills or any other symptom at all. In other words, no one truly gets sick from it. The bumps eventually go away on their own and usually do not leave any permanent marks. However, it sometimes takes 1-2 years for them to go away, probably because the immune system just doesn’t seem to care that much about Molluscum. The virus is passed along by direct contact and sharing objects such as towels and perhaps toys. It most commonly affects preschool aged kids. Babies seldom get it because they usually aren’t playing with or touching other kids who could be infected. Adults seldom get it, probably because they had it a long time ago and remain immune. The bumps themselves are infectious. Once all the bumps are gone, the infection cannot be spread. If the bumps are kept covered, it will not spread. There is some evidence that the infection spreads more easily in wet environments such as swimming pools and tubs, so it is usually recommended to avoid having children co-bathe with unaffected children. The key for spread really is close contact more than anything else. This is part of the reason why the infection really spikes sharply in frequency once kids are old enough to play with other kids and start playing in groups (preschool). Does my child need to stay home from school if they have Molluscum? Certainly, if they have bumps that are not covered they could very well spread the infection, but the infection is a harmless nuisance and will eventually go away without consequence. Its not unlikely that everyone ends up with it. Can you stop it from spreading? Covering lesions can help keep them from spreading. Discourage affected children from scratching at their molluscum. If they scratch them, they are very likely going to give themselves a lot more of them by spreading it around their body. Washing hands also works very well. I probably see 200-300 kids per year with Molluscum. I do not wear gloves when I see them (there is no need to) and have not developed Molluscum myself (I probably had it as a kid), but more importantly, I have not yet brought it home to my two little girls who have not had Molluscum. The hand sanitizer I use after seeing patients really does work. Should anyone ever worry about molluscum? 1. Kids with eczema usually have a worse time with molluscum. If their eczema flares, they become itchy causing them to scratch more and start spreading the molluscum around. Also, their inflamed eczematous skin, when broken down, is FAR more easily infected. Kids with normal skin might have 10-20 molluscum. Kids with poorly controlled eczema might get 200. 2. Adults who get molluscum should entertain being tested for HIV. Adult infection is just so uncommon that it is reasonable to be concerned that the infection is a sign of a compromised immune system. 1. Benign neglect. This means sitting back and letting the infection run its course. The only thing worth doing in this scenario is counting the number of molluscum from time to time. If they have 10 this month, 11 next month, and 11 the month after that, it’s very reasonable to just wait it out. The biggest upside of this plan is that the lesions usually don’t leave any kind of scars if they are just left alone. 2. Cantharidin, a.k.a. “Beetlejuice.” This is widely considered the gold standard for treating molluscum. It is a topical medicine, derived from a type of beetle (hence the name), applied in a doctor’s office to the bumps. The application is painless. A day or two later, superficial blisters form that lift the molluscum away. The blisters leave temporary red spots. If used on the face, there is some concern of scarring, but when used on the body, scarring is very, very rare. Kids tolerate this well and it is usually the best approach if the molluscum are spreading or bothersome. 3. Liquid nitrogen. Molluscum can be frozen. This works, but makes most kids cry. 4. Manual Extraction or “Squeezing them out”. They can be “popped” like a pimple. A little white core comes out and the molluscum is gone. Effective, but tedious. Most kids don’t like it. 5. Tretinoin or retin-a. This is an acne medication that causes irritation. If you cause enough irritation, you can sometimes get the immune system interested in the molluscum, wiping them out. This is often useful for molluscum on the face. 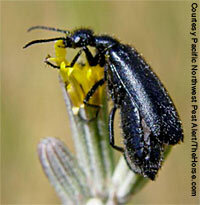 Pacific Northwest native punctate blister beetle. The main problem with cantharidin is that it is becoming unavailable. Beetlejuice has been safely used worldwide for at least 50 years, probably on more than 10 million people. However, it is not FDA approved for anything. It was on a grandfathered list of medications (like aspirin, tylenol, penicillin, and about 100 other common drugs), but in 1993 the FDA decided that grandfathered medications could only be used if the manufacturer filed an IND (Investigation New Drug Application) and performed a clinical trial. There were 5 American companies making cantharidin at the time, but they all stopped manufacturing it. Cantharidin is cheap, there is no money in manufacturing it, and none of the companies could afford to a do a clinical trial. Never mind that it is completely asinine for the FDA to demand a clinical trial on a topical treatment that has been used worldwide for half a century with a solid track record of safety and efficacy. After these companies stopped making cantharidin, the medicine remained available to dermatologists and pediatricians through compounding pharmacies who produced the medicine for use by physicians in their offices. This, however, has also come to a halt, at least nearly so. In several parts of the country, the FDA began sending cease-and-desist letters to compounding pharmacies telling them that, since the drug is not FDA approved, they cannot use it in compounding. It didn’t seem to matter that the FDA does not actually have this sort of jurisdiction over compounding pharmacies. Still, most compounding pharmacies are mom and pop shops–not about to give the finger to the FDA (although they should in this case). There are a notable few pharmacies that have told the FDA to stick to their actual regulatory domain and have continued to make the medicine – but these are now extremely rare. No one really knows why the FDA decided to crack down on this medicine. There were no reports of problems. I’ve never had trouble with it. I don’t know of any dermatologist that doesn’t love using it because of how well it works. A local dermatologist, Dr. Sidbury at Children’s Hospital in Seattle, has led a campaign to solve this problem and has been trying to work with the FDA to find a sensible resolution. The FDA essentially won’t return his phone calls. Luckily, our neighbors to the north have no problem with cantharidin and many dermatologists are able to obtain the medication directly from one of the two Canadian manufacturers of it. So, if your child won’t stop picking at their bumps, give us a call.